How to crochet a lovely handbag with 3D diamonds stitch! from the center, place the knot into a hole and make a slip stitch. 3sc in each hole arround, 2sc into the last hole, slip stitch to the 1st stitch, change to 5mm crochet hook. *** watch my free video tutorial witch shows you how to make the 3D diamonds stitch step by step. Round 2: yarn over, insert the hook into the next chain 1 of previous round, yarn over & pull through a loop (pull up all loops), yarn over, skip 2, insert the hook into the next chain 1 of previous round, yarn over & pull through a loop (pull up all loops), yarn over pull through all loops, yarn over insert the hook from back to front, make 1dc into the 1st skipped stitch, yarn over pull through all loops, yarn over insert the hook from back to front, make 1dc into the 2st skipped stitch, *yarn over, insert the hook into the same chain 1 of previous round, yarn over & pull through a loop (pull up all loops), yarn over, skip 2, insert the hook into the next chain 1 of previous round, yarn over & pull through a loop (pull up all loops), yarn over pull through all loops, yarn over insert the hook from back to front, make 1dc into the 1st skipped stitch, yarn over pull through all loops, yarn over insert the hook from back to front, make 1dc into the 2st skipped stitch* repeat from * to * around. In the end of round 13 mark 4 corners. Round 14: *1sc in each stitch until the stitch marker, insert the hook into the stitch with stitch marker, yarn over&pull through a loop, skip next stitches, insert the hook into the stitch with next stitch marker, yarn over&pull through a loop, yarn over&pull through all loops*, repeat from * to * once, 1sc in each stitch across until the end. 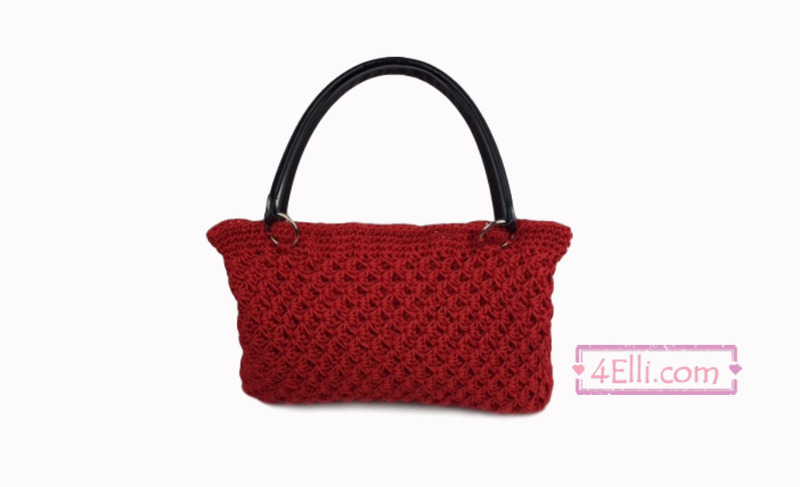 Watch my free video tutorial witch shows you how to make this lovely handbag step by step!